When Kerstin and I took our daily morning walk today, the full moon beamed from a starlit sky. It was windless and -10ºC – a beautiful morning! The rest of the morning ritual consists of rye porridge with black currant jam, morning prayer and reading of the smaller local newspaper Ulricehamns Tidning and the larger local newpaper Borås Tidning. Almost every morning at our house, Övregården in Töve, proceeds this way. Only the weather changes. I think we need both steady and varying elements in our lives. 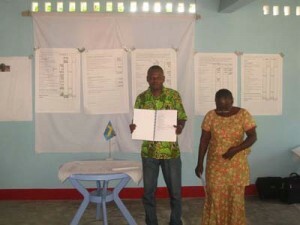 At last, the first entrepreneurs in Congo have received their loans. Our man Yapeco has managed the payments. Together, they have received $27,350. The payments were delayed by one month exactly due to the non-functioning Congolese banking system. The money was sent last Friday as an ordinary bank transaction, in Euros exchanged to US dollars. This Wednesday, they landed in our bank account in Banque Internationale Pour l´Afrique au Congo in Matadi (BIAC). For our entrepreneurs, it was a much anticipated day. Now there will be a moment of truth for our first borrowers. Will they live up to the statements they´ve written down in the course material and in the contracts: to do their investments according to their investment specification, and to sell according to their sales budget and then not burden the business with more costs than the budget permits them to? Month by month, this will be followed up and accounted for on the website. The accountancy will be open for all MSG sponsors to see. The first account will concern the investments. New challenges lie ahead of us: ten new entrepreneurs stand in line, and there is an agricultural project of 315 hectares fertile soil and a hotel building construction in Matadi to mention some of them. What if we could give some Congolese the opportunity to go from poverty to prosperity and what if they someday could exclaim: What a day!! Tack för er reseskildring. Jag blir glad inombords av ert engagemang och kärlek till kongoleserna. Önskar er Guds välsignelse och vishet i ert arbete. Staffan Andersson Ex. hökerumare ocg fd. Matadibo. Tack för att ni engagerar er i detta land med så stora behov. Var i Luozi den 6 sep. 2009 när Mawandakyrkan invigdes. Idag träffade jag Julienne K.